Posted on Fri, Jul 6, 2012 : 5:35 a.m. The moment that all restaurant reviewers dread has finally arrived for me. I've been struggling with that devil's bargain of telling the world about an amazing find, while at the same time selfishly considering keeping it on the down low to savor in peace. In the end, I've decided that revealing my enthusiasm for the new(ish) Zingerman's Pop In will serve the greater good if more people enjoy an often extraordinary meal at an incredibly reasonable price. Still, I want to be as discouraging as possible, so let's first enumerate the negatives. The Pop In, which is Zingerman's version of a "pop up restaurant," is open only one day a week — Wednesdays (but sometimes Tuesdays) when you probably have bowling or some crucial meeting. And it's not every week. You don't know more than a week in advance what will be on the menu. Also, the chairs are not particularly comfortable, and the exposed brick walls are unfinished. Sometimes the bartender makes the drinks too sweet. Every so often they play music I don't like. One night they showed an incomprehensible Korean monster movie. And once there was a chalky and less-than-yummy chocolate sauce on one of their desserts. You probably don't want to read any further. I'm sorry to say that other than the above, I love the concept and the execution of the Zingerman's Pop In, located in the old eve restaurant space in Kerrytown. Only a block from the Deli, the site is now Zingerman's Catering's new "private event" space. Hosts for the Pop Ins rotate among various ZCOB (Zingerman's Community of Businesses) businesses: One night it's Asian street food from San Street, the next time it's a family style meal in Tunisia with Cafe Memmi, while another week you'll find down-home barbecue put together by Zing's Catering. Catering Manager Nancy Eubanks says the Pop Ins developed as a fun way of utilizing the event space and incubating new businesses and new directions when there aren't competing reservations. The first Pop Ins started at the beginning of the year (after Mark's Carts had closed for the season), giving San Street's young owner a space to experience running a restaurant and an opportunity to perfect future menus. 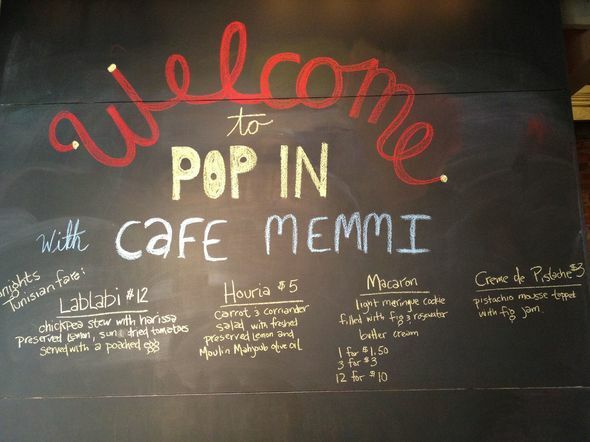 Now, Cafe Memmi — a Tunisian startup being nurtured by the Zingerman's Community of Businesses — has also begun to have Pop Ins as they work toward opening in a more traditional model. Eubanks says that "the concept of the Pop In is meant to be fun and loose and give space for some of our really creative chefs to try something new, spread their wings and do some cuisines not being made in the Deli already." She continues "We (ZCOB) have a wonderful system of setting up and nurturing new businesses, with the guidance of all the great knowledge that's here. But this one (the Pop In) kind of flew under the wire and opened, and part of the charm is that it isn't completely thought out." A recent Pop In featured the cheeses, charcuterie, and accompaniments of Spanish tapa — which Eubanks said was a way for Zingerman's Retail to highlight its Spanish products that people may not have had a chance to try before. I was excited to finally get to try the famous Spanish Pa amb tomaquet, toasted bread rubbed with tomato, garlic and olive oil. The little adventure of trying new, interesting and delicious food is a big thing I appreciate about the Pop In. In these weekly explorations of different cuisines of the world we've been able to try Vietnamese pho, Taiwanese steamed buns, Tunisian lablabi, Spanish tapas, and southern barbecue. There's usually a vegetarian option, a dessert, and also a special cocktail of the night. And did I mention the price is right? The front part of the Pop In space, which used to be the bar of eve, looks to me very much as it used to look: a few two- and four-top tables, and gray, felt-upholstered booths up against the wall under the windows on the left as you enter, with the bar to your right. But now, a big blackboard in the colorful Zing signature style has the abbreviated menu of what's being served that evening. As you walk in, you place your order for a drink at the bar (there's usually a very reasonably priced cocktail special, and house beer and wine choices) as you pass by to find a seat in the dining room. The larger dining room looks different than it used to, and the room feels somewhat raw and unfinished. The dramatic swags of fabric that used to cover the walls have been removed, leaving exposed brick in various states of repair on view. The small tables scattered throughout bring to mind Ikea, though pendant bubble lights lend a warm glow and the "kissing booth" in the corner is still there and usually has a table and chairs ready. The last time we were there brown paper covered the tables and a small vase on each table held a fresh posy. The flowers are a nice touch. I have found the food at the Pop In utterly delicious and often beguiling. I think part of the secret is top-quality ingredients that often include fresh herbs and spices and an effort to re-create an authentic taste experience of well-loved dishes of the world. And I love that it's extremely reasonably priced, usually $10-$12 for a perfectly sized meal (and almost always a vegetarian option). There might be a choice of an additional side dish, and always a dessert. We have enjoyed the cocktail specials as well — drinkable quaffs like Sangria or the French 75 — that tend to match the theme of the evening. They have a full bar, but limited wine and beer choices. The bartender is not always up on making drinks even a little out of the mainstream, like a Red Hook. But they have been very accommodating (and good at) requests for a fresh limeade. Yes, I still miss Drakes. 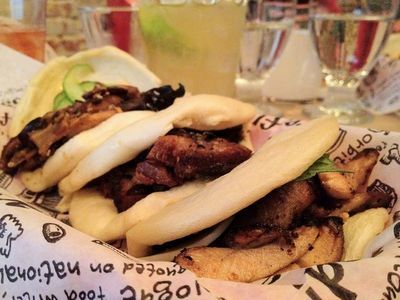 Our first time at the Pop In was for San Street's savory Taiwanese-style open face buns. San Street's owner, Ji Hye Kim, says they make the buns from scratch and roll them out individually by hand into an oblong shape after which the dough is folded and steamed. Into the resulting soft, slightly sweet bread pocket goes a savory filling — like Momofuku-inspired pork belly (which they call their "Lucky Pork Bun homage to Momofuku), spicy chicken, or "Fun Guy" mushroom. The pork belly (of which there is a separate version cooked with Chinese 5 spice) is what pork belly is supposed to be: thick slices of layered meat and melting fat, crispy on the outside and juicy on the inside, like confit. Man, the buns are good. One of our dining partners (Rex) described the Momofuku process (on which San Street seems to base its homage) for making the pork belly. "After a dry rub of sugar and salt, Momofuku is reported to submerge their pork bellies in pork fat to cook. After you cook it, then you need to chill it to get those nice thick slices. Then you crisp up the slices on a flattop grill for more caramelized goodness. It's the ginger/scallion sauce that really takes it over the top." The chicken buns with pan-fried chunks of soy-garlic marinated chicken thighs with ssamjang (Korean fermented bean and chili paste) and a perilla leaf were also very good, if slightly dry that evening. But the mushroom version actually turned out to be my top favorite of the buns. Both tender shiitake and chewy wood ear mushrooms sauteed together are garnished with fresh cucumber pickle and a little sriracha mayonnaise for a totally umami, and creamy, spicy, tangy taste sensation. Hours: Usually weekly on Wednesday evenings 5-9:30 p.m.
On a recent visit we tried Cafe Memmi's lablabi for the first time. This chickpea stew, sometimes called the national dish of Tunisia, is often considered a breakfast dish. Savory chickpeas in a garlicky broth spiked with harissa and bright with preserved lemon and sun dried tomatoes were topped with a poached egg. Chunks of bread are broken in to soak up the cumin-scented broth. It's a deeply comforting dish with exotic flavors layered like veils. On the side, Houria turned out to be well-roasted whole baby carrots, served at room temperature, infused with warm coriander and perked up with more fresh and preserved lemon. Cafe Memmi's desserts were wonderful as well. Pink French-style macarons sandwiched rose-scented buttercream. Some of the finicky diners at our table found the almond macarons too chewy and lacking in fragility. I, however, enjoyed the substantial crunchy mouthful with just the merest whiff of rose. But what I'm still dreaming about from that evening is the Creme de Pistache—a rich and silky pistachio mousse with a bronze pearl of fig jam hidden in the middle. We loved it so much we had to order another round. My request for coffee with dessert reminded me why Zingerman's establishments stand above the rest. The disappointment showed on my face when our server said they didn't have coffee at the Pop In. But, he offered, he could get me a coffee from the Deli across the street. I made noncommittal noises and resigned myself to coffee-less sweets. Much to my surprise, our server was true to his word and a coffee appeared with the macarons. I don't think they even charged me for it. That's a textbook Zingerman's experience. Our latest date with the Pop In was for the tapas "taste of Spain" evening. I thought this was a fun concept because I am one of those people who has not tried the fig and almond torta or the Miguel and Valentino bocquerones (pickled sardine fillets) in the Zing retail store. And I probably would not purposely buy the morcilla (aka black or blood sausage). But I really enjoyed trying all of these among other delicious items offered in the beautifully plated Quesos (cheese plate), Pescados (fish plate), and Charcuteria. Marcona almonds on the side were crisp and salty, and a selection of marinated spanish olives included some herbal, some rich and buttery, some grassy and sharp. And as I mentioned earlier, the Pa amb tomaquet was delicious — toasted farm bread rubbed with garlic and tomato and basted with olive oil. After sharing tapas and sangria with a group of friends, I felt like I had at least been to Spain mentally if not physically. And that appealing experience seems to match what Nancy Eubanks told me they had hoped for — a relaxed place to come after work to share drinks and food with friends over conversation. Although I have also seen a good number of parents there with young kids who seemed to be enjoying themselves as well. Although some things are served in plastic baskets and all of it with paper napkins, it's obvious that the food at the Pop In is fresh and handmade, from the steamed buns to the desserts. Nancy Eubanks says that this time of year most of their produce is sourced locally, and that now much of the meat at the Deli is local as well. The fact that they use excellent and often unusual ingredients in exotic (yet homestyle) dishes that I mostly wouldn't think to make at home — like pho or Lablabi — also suits my sensibilities. I know there's a segment of people who love to hate Zingerman's because they think it's overpriced and will doubtless have some snarky comments. But I think this model is genius because you might love the Pop In for the fun and good food and never realize that Zingerman's has also set it up (as they do with so many things), with a social mission and a willingness to experiment and extend their support in a way that is invisible to the general public. Ji Hye Kim, owner of San Street and hopeful entrepreneur, says that for her, the "amount of support from Zingerman's has been really tremendous. On an everyday basis if I have a question I can email and get a response right away. On a day we're short handed, I can email and they'll come and help me. It's amazing to have 500 people rally behind you." I have been to a Pop In when the atmosphere was basically a Zingerman's staff party — with fun and interesting people that you would enjoy knowing. But in general, the fact that the Pop In dinners offer excellent food in a relaxed, low-key atmosphere with (another signature Zingerman's move) super friendly customer service, just wraps it up for me. I love the confidence of knowing that I'll be having a wonderful and interesting meal, comfortable surroundings, and a warm welcome. I happen to love that there are only one or two options on the menu. And, while it lasted, I have secretly enjoyed the sort of "underground" or at least "undiscovered" aspect of the Pop In too. Nancy Eubanks told me that initially she had hoped they would put out fliers on telephone poles to announce the Pop Ins. She wanted to give it that feeling of discovery, like for the bands and underground events that continuously move through town. Instead, they mostly use social media for spontaneity. You either look for the Pop In at the Zingerman's Facebook page or on the Zingerman's Twitter feed. But they do have a Pop In email list—you can sign up for it online or in person at a Pop In. Or you can call Zingerman's Catering at 734-663-3400 for more information or to get on the list. And like I said — it's probably not convenient that night. But if you do go, please save me a seat. Sat, Jul 7, 2012 : 3:49 a.m. I got to hand to it Zingermans...this pop-up concept will give them a readymade excuse to crank up the prices...or is that...pop them up... each time the place opens. Fri, Jul 6, 2012 : 8:41 p.m.
Nope - not for me. Too expensive for what you get based on other places to eat. We have never been Zingermanized due to these high prices. Fri, Jul 6, 2012 : 3:52 a.m.
http://dexter.patch.com/articles/zingerman-s-roadhouse-chef-alex-young-buys-hoey-farm-plans-expansion-of-food-services-in-dexter Thank you, SemperFi. I had no idea but, think it is a great thing for Dexter. Thu, Jul 5, 2012 : 7:38 p.m.
MMMMM Tasty Dont forget to bring a couple credit cards. Thu, Jul 5, 2012 : 7:11 p.m.
Thu, Jul 5, 2012 : 6:17 p.m. I enjoyed this story. I liked to hear about the quirky nature of this particular enterprise. I am not, as Lounsbury portends, a follower of the &quot;Church of Zingermantology&quot;, but I do enjoy going to their differing locations. They have a certain vitality that other establishments lack. Zingerman's has done many things well over the years and nothing attracts critics faster than success. Also, I'm very excited to experience the new farm location of Zingerman's Chef Alex Young in Dexter. I'm surprised there hasn't been anything in the A2dotCom about it. Thu, Jul 5, 2012 : 4:58 p.m.
Something vegetarian in the Zingerman's world would be welcomed. As a townie, I view Zingerman's perhaps as residents of Orlando view Disneyworld: I'll go there when dragged by others, but it's undeniably a good experience. I tend to stay away partly because of high prices, but I pay high prices elsewhere. The main reason I stay away: they don't have much I want to eat any longer. Their &quot;know fat&quot; stuff may be fine for those who can eat a bunch of fat, but I tend to see a lot of people who are trying to lower that part of their diets. Zingerman's is not a rewarding place for low-fat eaters. Thu, Jul 5, 2012 : 6:39 p.m.
And Seva isn't a rewarding place for meat eaters. And if you can't eat dairy products, you won't like gelato places a lot. Thu, Jul 5, 2012 : 1:16 p.m.
Had a long Sunday lunch at Momofuku Ko in the East Village a couple months ago. If the food here (or at San Street) is 1/2 as good as that it would be the best food in Ann Arbor. Also, if you think Zingerman's was pricey, try the lunch at Ko: $175 prix fixe was what i reacall but may have changed since then. Fri, Jul 6, 2012 : 9:23 p.m.
JRW...AA is not NYC, and we are proud of it. Otherwise, we would be in NYC, the thought of which makes me shudder. So thanks for noticing. Fri, Jul 6, 2012 : 3:41 a.m.
&quot;I prefer to spend money on transcendent experiences rather than things&quot; can usually be translated into &quot;I'm between jobs right now, btw&quot;. Thu, Jul 5, 2012 : 6:03 p.m.
Marvin, just for the record I didn't mean to imply in any way that I think your spending that money was a waste. As you said we all value different things. Thu, Jul 5, 2012 : 5:32 p.m.
That's $175/person. My wife and I went for lunch. It takes all afternoon. Several hours if I recall. You sit around the bar and basically have small plates of amazing food, drink, and converse all afternoon. Craig, I spend my money on transcendent experiences rather than things. I suppose we all choose to spend our money in different ways and place value on different things. JRW, I agree that Ann Arbor is not NYC nor was I trying to compare the two. The author of the post mentioned Momofuku twice without explaining what or where it was. I only referenced it in that the food at Ko was amazing. If someone here in my beloved li'l ole A2 was trying to prepare food mentioned in the same breath as Ko, i find that interesting and promising. Thu, Jul 5, 2012 : 5:06 p.m.
Our primary connection to New York is all those out of State students who couldn't quite get in to an Ivy league school. Thu, Jul 5, 2012 : 4:55 p.m.
Ann Arbor is NOT NYC, not even close, hence the more expensive food in the East Village. No comparison. A2 is a small midwestern city with a university that thinks it's NYC on a smaller scale, but it's not even in the same universe. Thu, Jul 5, 2012 : 1:44 p.m. If I won the lottery i don't think I'd spend 175 bucks for lunch. But thats just me. I checked there rather &quot;understated&quot; website. Why is lunch longer and more expensive than dinner? Thu, Jul 5, 2012 : 1:13 p.m.
&quot;I know there's a segment of people who love to hate Zingerman's..... and will doubtless have some snarky comments.&quot; I'll take the challenge although I don't &quot;love to hate Zingermann's&quot;. I am utterly indifferent to them. I am however fascinated by the cult that is the &quot;Church of Zingermanntology. &quot; You just did a rather long review of a restaurant that's never open (by restaurant standards) And on the rare(by restaurant standers) days that it actually is open it doesn't have a set menu a reviewer can discuss. &quot;The burrito is to die for...but it won't be on the menu when your there, sorry&quot;. For some reason I can't get the image of Tom Cruise jumping up and down on Oprah's couch out of head. Sun, Jul 8, 2012 : 6:44 a.m.
Thu, Jul 5, 2012 : 12:25 p.m. Seems like food gets a second chance at the Pop-In? Is that right? Thu, Jul 5, 2012 : 1 a.m. Wed, Jul 4, 2012 : 1:38 p.m.
What is going in across from there in the old Sushi restaurant space? Wed, Jul 4, 2012 : 1:37 p.m.
Just like downtown, with the absence of Borders, I no longer frequent Zingermans because of the ridiculously high prices. Want a great corn beef sandwich try the Bread Basket on Ellsworth. Sun, Jul 8, 2012 : 6:42 a.m.
Maize and Blue is just as good as Zingermans at almost half the price, for a corned beef sandwich. Wed, Jul 4, 2012 : 1:22 p.m.
oh, and bring your wallet! Wed, Jul 4, 2012 : 4:30 p.m.
..and your appreciation for the finest ingredients. Wed, Jul 4, 2012 : 12:29 p.m. These are well worth going to. One thing not mentioned (Kim may not have encountered it) is that items can run out, so you want to get there as early as you can for maximum choices. Wed, Jul 4, 2012 : 10:54 a.m.